Home/North Carolina, Restaurant/37th Street Pizzeria & Pasta Co.
As the name says: pizza & pasta done right! Specializing in pizza–regular, thin, traditional, hand tossed and Chicago deep dish. The pasta dishes are the traditional lasagna, baked ziti, manicotti, jumbo shells, tortellini and spaghetti, DONE WELL! All sauces, meatballs, pizza dough and their signature garlic bread are all made from scratch daily. 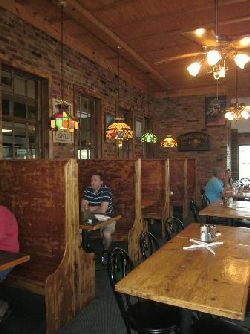 The decor is warm and friendly, with wooden booths and a row of tables right next to the open kitchen so you can watch the action. Great find, this will be a place that we will be revisiting! Debbie and I shared a lasagna and a 10 inch Chicago deep dish, WOW!! What a great meal.